Assessment 12 Edition Assessment is a process of collecting information for the purpose of making important decisions about students. It is critical that those decisions be made both appropriately and fairly. Noted as the standard for professional resources in the field, ASSESSMENT offers basic assessment information along with a handbook-style reference of frank, comprehensive reviews of the tests most administered in K-12 schools. 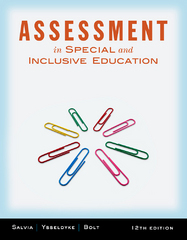 Featuring an emphasis on improved outcomes, the book equips teachers with the tools and knowledge to do assessments correctly as well as use assessment information to bolster student competence.